Enjoy four (4) complimentary tickets for reserved seats in the Producer's Row for performances at any one of these times: Wednesdays, Thursdays & Fridays at 8 PM. This also includes a BACKSTAGE TOUR which is very special. Valid: January 10, 2018 thru November 9, 2018. This is a special opportunity for the winner to be Producer, Jo Schuman Silver's, guest at the award-winning musical revue, Beach Blanket Babylon. 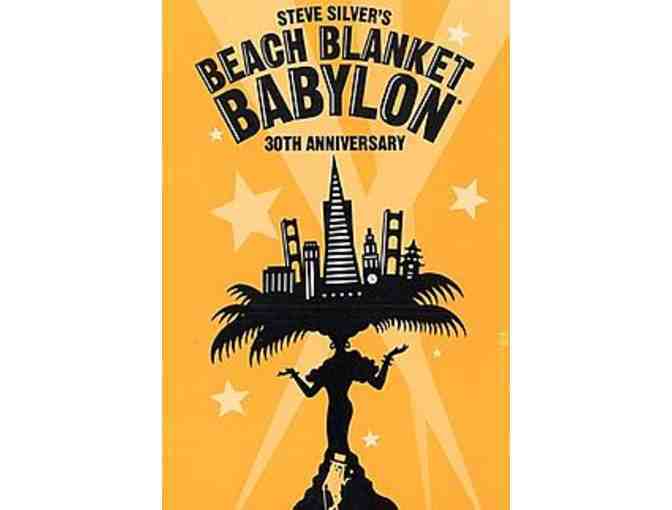 Beach Blanket Babylon, the longest running musical revue in theatre history, is a zany musical spoof of pop culture with extravagant costumes and outrageously huge hats. Now in its 36th year of sold-out performances, Beach Blanket Babylon is an internationally acclaimed San Francisco institution. With more than 12,000 performances in San Francisco, the show has performed for standing room only during its London and Las Vegas engagements. Beach Blanket Babylon continually evolves in its hilarious parodies of current events and popular icons as todays headlines unfold. There is a cash beer, wine and soft drink bar. Soft drinks only on Sundays at 2pm and 5pm. Valid: Valid: January 10, 2018 thru November 9, 2018. Everyone in your party must be 21 years of age unless you are attending the Sunday performances, and be prepared to present a valid, government -issued picture ID. After the on-line auction closes, this item will be going to a silent auction taking place, in San Francisco, on December 5, 2017 for further bidding. Absentee Bidding is offered and encouraged. Absentee winners will be responsible for shipping with insurance charges. All sales are final and there will be no exchanges or refunds on items. Purchasers are bound by the restrictions specified by the donors. All auction items and services must be used by November 9, 2018 unless otherwise specified. In accordance with California State Law, 8.75% sales tax will be added to all tangible items. Please consult the "rules" of the Holiday Heroes Silent Auction for other information.